When families move, they often take the opportunity to go sort through their belongings. Oftentimes, they will find that they own more than they realized, so a garage sale ensues. If you're looking to get rid of some clutter, hosting a garage sale is a great way to do that while actually making some money! 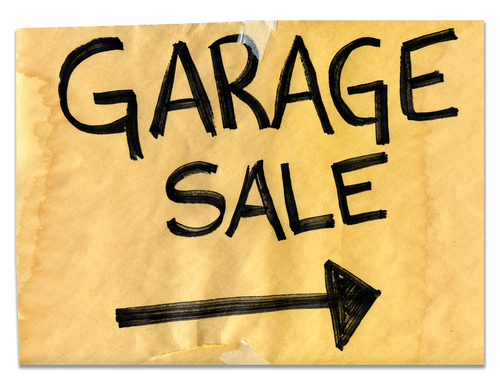 Here are a few tips that will help you put on a successful garage sale. Planning is probably the most important part of the process. You want to have a good inventory of items, whether it’s clothes, toys, or random other things you want to sell. Garage sales are only as good as the products in stock. Also, keep in mind that it’s always a good idea to look into restrictions in your area or the covenants in your neighborhood. It is against the law in some areas to host a garage sale without a permit, and in other places, there are strict laws about signage. Have the garage sale on your mind all year long. Find a bucket or carve out a corner in the basement for those things you'd normally throw out or donate that someone else may find valuable. Remember - one man's trash is another man's treasure. Don't have your sale at home if you’re tucked away on a long driveway off a country road. Find a friend who lives on a busy street or in a condensed suburb or find a public place to have your sale. No matter how great your inventory, it’s not worth a thing if no one sees it. 3. Think about the weather. Check the forecast. Just because it is sunny in the morning when you’re setting up doesn't mean it will be clear all day. Obviously, you’ll do the best business on a good weather day, start to finish. Don't overlook the importance of setting up a garage sale properly! Think about the customer experience and the things that make you stop at certain garage sales, even while you drive right past others. 4. Realize the importance of great signage. A cardboard box with dripping spray paint nailed to a pole isn't going to attract the most and best customers. Make clear, bright, aesthetically pleasing signage that will stand out. Put signs up at busy nearby intersections with clear directions as to how to get to your sale. 5. Display your best items most prominently. The one thing that makes people stop at a garage sale is seeing something that intrigues them from the road. Put your best stuff out there to be seen, so that shoppers will be interested immediately. Make the things you display diverse, as to draw in a wide range of potential buyers. 6. Set up your sale in sections, like a retail store. Create sections. Don't force a potential buyer to bounce back and forth looking for things. They’re more likely to buy in bulk if things that you display are similar and close together. Make 25 cent, 50 cent, and one dollar tables. Your customers will love to search for affordable little treasures. It makes the experience easy and fun for them and makes organization and set up easy for you. Everything beyond those commonly priced tables though should be marked individually and clearly. If you’ve had a previous sale, be sure to remove old price stickers from your items unless the price is the same this time around. You don’t want customers confused about pricing. Know the value of your items, and keep in mind that the reason you're having a sale is to clear some clutter, right? There’s no need to expect huge profits or make people feel like you're taking advantage of the opportunity. Once customers start coming in, your job has just begun. You’ll have a lot of tidying up and negotiating to do! 8. Be willing to negotiate. Don't just give things away, but if a person makes a reasonable offer, accept it. They're more likely to keep shopping and come back when they see you're having another sale. You may turn off other potential customers if they see you arguing with someone else over fifty cents. 9. Make it a family affair. Set up a lemonade stand, give out hot dogs, and decorate with colorful flags. These elements will bring attention to your garage sale, and get your kids involved. 10. Have a lot of fun. The most important thing about a garage sale is keeping it fun for everyone, both the seller and the buyer. Remember the importance of keeping things upbeat and making everyone feel welcome. If it’s fun, you're more likely to sell more and have repeat customers at your next garage sale. Here’s to making your garage sale a roaring success!